International Journal of Research in Health Sciences,2019,7,1,14-22. 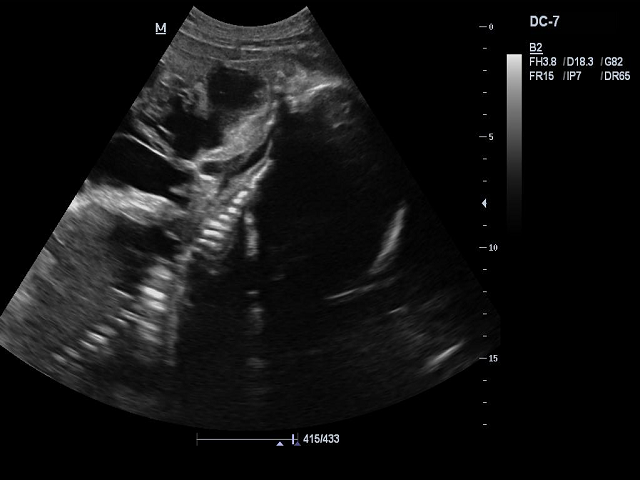 A routine antenatal ultrasonography at 20 weeks of gestation revealed a large multicystic mass lesion arising from the neck region. The lower half of the face, mandible and lips could not be differentiated from the lesion. An MRI was performed to see the extent of the lesion. It revealed a large well defined fluid intensity lesion arising from the oral cavity and anterior aspect of neck, extending upto the xiphisternum externally. Internally it was seen compressing the oesophagus and larynx with intrathoracic extension into the mediastinum and abutting the heart. The patient was followed postnatally when a full term live baby was delivered by lower segment caesarean section which succumbed few hours later. Our findings were confirmed and clinically relevant photographs were obtained. Cystic hygroma or nuchal lymphangioma arises from delayed development or maldevelopment of the lymphatic system to communicate with the venous system of the neck. ultrasound image showing location of the lesion, adjacent to the vertebral column, from the neck region.